October 22-23 we graced a small corner of the Walt Disney Swan & Dolphin for the 2008 10th annual Audioholics State of the Consumer Union (SOTU for the true geeks) event. We ate, browsed, cha-cha'd, and got more than our share of exploding robots. Attendance was low (thanks, Bernanke), sound pressures were high, and plenty of new stuff was on hand to ogle. In the RBH / Yahama room we had an 83" diagonal Center Stage screen showing, yes, plenty of exploding robots. Sorry for the quick pic, but the Epson 6100 had enough prototype issues that getting a quality screenshot wasn't possible. This screen had the Somfy motor option with the IR receiver you can see sitting on top of the case. Behind the screen was RBH's new EF70C center channel, properly oriented vertically to match the off-axis frequency response of their new EF70T tower speakers. While three EF70T fronts would have been ideal, the front imaging was great. They had a couple upper corner speakers that the new Yamaha receiver used for "presence," but the effect was intentionally subtle. The fronts were adequately spaced out in the room and had very nice depth to their sound as it was, so the presence channels didn't do much. My choice would just be three EF70T speakers and a larger screen. 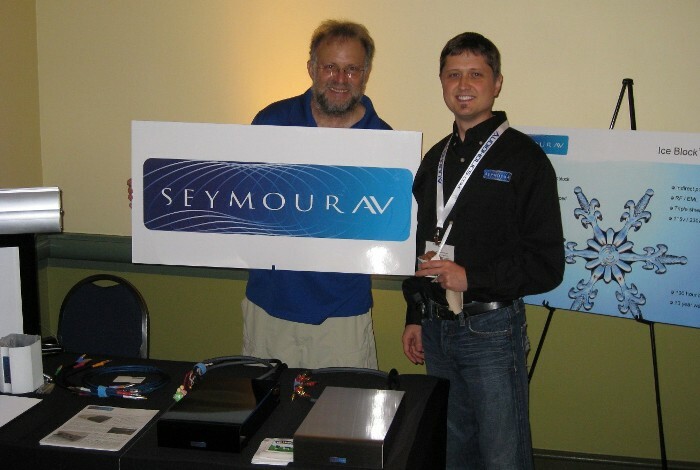 Not hauling down the entire CEDIA demo left us with a humble table in the hallway to display our other products. On the left side you can see a micro-sized Center Stage screen, which showed the brushed aluminum finish, standard RF motor, and enabled people to personally pet the Swiss velvet fabric borders. In addition to cables, swag, brochures, and screen samples, we had two Ice Block amplifiers on display in the black pearl blue five-coat glossy paint and stainless steel finishes. Both were 1000w. Here is Jerry scooping his ice cream to the Audioholics SOTU attendees. He enjoys his Center Stage screen so much he wanted to do this for us. We were all thrilled by his generosity and enthusiasm. Cherry Garcia, Chocolate Fudge Brownie, Chocolate Chip Cookie Dough, Vanilla Heath Bar Crunch, or any combination you desire. Some indulged in a spot of all four. Special thanks not only to Jerry for his kind heart and enthusiasm, but also to Ray Miller (my FedEx savior) and JP Torres from Yamaha, and Shane Rich and Daren Egan from RBH.